I was on the trail again by 7am and knew I would have an relatively easy hike today to the junction of the PCT with Interstate 15. I was looking forward to seeing Donna – she was going to meet me at the Best Western Cajon Pass. As I hiked up the trail away from Silverwood Lake, I enjoyed the views back towards the lake. The picnic area that I camped in last night is in the foreground of the above photo. The first few miles of the trail were uphill as I left the Silverwood Lake area and then headed lower for the next few miles. As looked westward towards the Cajon Pass I could see clouds. The trail passed through a pretty valley as it headed towards I-15. This is a photo looking back at the valley. Then the trail headed back uphill and over a ridge to reveal views of Cajon Pass and Interstate 15. The final few miles before the Interstate were downhill and very windy. It was nice to finally reach I-15 and the infamous sign directing PCT hikers to McDonalds. I enjoyed a Big Mac, large order of fries and several large Dr. Peppers. Hit the spot! It was a short walk to the Best Western. I checked in and Donna arrived shortly. It was really good to see her and get updated on her knee and all the happenings at home. It was also nice to do some laundry and take a shower. And then Donna surprised me with a delicious dinner of ribs, a baked potato and a fresh salad. Yum!!! I had a good night ‘s sleep last night. My campsite was on a ridge and a little exposed but the winds weren’t too bad so the night worked out well. My goal today was to get to Silverwood Lake at mile 328.5. There would be water, restrooms and picnic tables. My understanding was that this was the last water source before reaching the I-15 interchange at mile 342, where I would meet Donna tomorrow. Very shortly after starting my hike I dropped down to the Mojave River Forks Dam at the end of Deep Creek. This is a flood control dam. Now I’m confused in exactly what the proper name of the creek is – is it Deep Creek or Mojave River??? I don’t know for sure. Anyway this is the dam – the creek is on the left. Shortly after passing below the dam on the creek side, I crossed the creek and filtered some water. This is where the creek flows through under the dam. Here’s a view looking back at the dam after I had hiked up the PCT about a mile or so. and enjoyed views of the pasturelands in the foreground. And after a few more miles I reached the lake. It’s a big lake and it took a while to hike to the end of it where the picnic tables and restrooms were. As soon as I got to the picnic tables, someone was driving by selling ice cream. I couldn’t resist. Some of the other PCT hikers had ordered a pizza and they were nice enough to give me a couple slices. After eating and resting a bit, I hiked another mile or so to this picnic area near Silverwood Lake. There was water and an electrical outlet, so I decided to camp here and charge my phone and portable phone charger. And I enjoyed another delicious dinner on the trail. Tomorrow morning I will fill up with water for my 13 mile walk to the I-15 junction where I would meet my honey (Donna!). I have missed her the last three days. This morning I was up before 6am and hiking at 6:30. I knew I had to hike close to twenty miles today so I was motivated from the get-go. I had camped in a forested area along Holcomb Creek. The first few miles today continued along this creek and I passed several large established camping areas. Soon I had views north towards the San Gabriel Mountains which are east of Los Angeles. 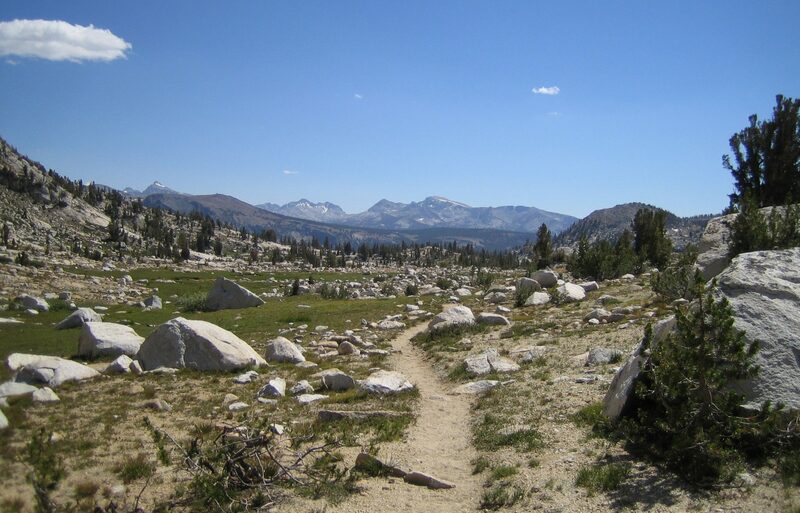 The PCT passes through this mountain range and I expect to be there in a few days. If you look closely you can even see the fog bank that is stretching up I-15 near the Cajon Pass. which had pit toilets (awesome!) and trash cans (nice!). I made deposit in each and lightened my load (Hahaha). When I returned to the official PCT I was soon traveling down Deep Creek Canyon. There was a lot of water flowing down Deep Creek but the trail stayed several hundred fee above it for most of the afternoon. I passed the 300 mile mark – another notch in the hiker belt. And continued down Deep Creek for about fourteen miles. There were a lot of inviting swimming pools but unfortunately the trail was too far above the creek. At about Mile 308 there is the Deep Creek Hot Springs. This is a popular destination for PCT hikers as well as local people. It is known as a “clothing optional” destination. As I approached the hot springs I saw the following sign, apparently placed by “Party Boy”. Not one to party with strangers nor take my clothes off around strangers, I continued on down the trail. But I did snap a few photos. I did hike down to the stream to collect drinking water above the hot springs as I was warned not to drink the water below the Springs (for obvious reasons). and then continued for another few miles until I reached my camp site above the dam at the bottom of Deep Creek.